Today I've got a quick little post for you. I promise I'll be back on form soon, there has just been alot on my plate recently and I haven't been able to get content out to you guys as frequently as I would like. However in the mean time I wanted to tell you all about Laurent-Perrier's summer special menus across London. Laurent-Perrier is my favorite champagne. Although me and Dan bought a magnum at New Year only to discover that even our love for it couldn't muster enough to drink a magnum for 2. Let down's aren't we. The summer menu's are a range of 12 set menus across 12 of London’s hottest restaurants, all with a glass of Laurent-Perrier Cuvée Rosé. So I popped along to German Gymnasium to try one of the menus. 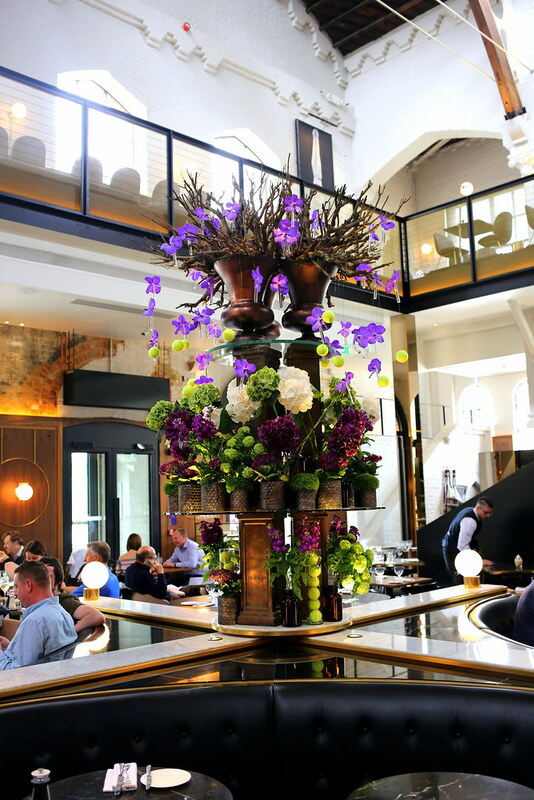 German Gymnasium is a stunning restaurant over in Kings Cross. The building was originally England’s first purpose-built gym, with the money coming solely from London's German community.It was used by the German Gymnastics Society and then went on to host the indoor events at London's first Olympic Games in 1866. Spread across two floors, we headed upstairs for a spot of lunch. Of course we started with Curvee Rose. The Rose is my favourite out of the Laurent Perrier collection. Sweet but not overly, it is just a great drink for summer. And trust me, it's very drinkable... 1, 2, 3 glasses anyone? We started with smoked salmon and cream cheese roulade, summer greens, verbena vinaigrette. I have to say it was delicious. I love smoked salmon and cream cheese and this did not disappoint. Next was chilled cucumber soup, prawns, linseed oil. It was however a cold soup. I've never been a fan of cold soups, and whilst I still wouldn't order one of the menu, this was good and I nearly finished it all. Finally for the savoury it was grilled duck breast, fondant potato, rosemary roasted peach and blackcurrant jus. I adored this course, The duck was cooked to perfection and the potatoes were delicious. I wanted another round of this. Of course a summer menu, wouldn't be a summer menu without a fruit based dessert. Strawberry hibiscus parfait, lemon sorbet, macerated strawberries and crumbles. Sweet, light and rather refreshing. The food at german gymnasium is fantastic and one not to be missed. The 4 courses and a glass of champagne is £45pp which I think is fantastic value. The summer menu's are at 12 different restaurants, which you can see all the menu's here. But be quick they end, the end of this month! This place popped up somewhere and since then I have been so eager to go! At £45 for 4 courses with a glass of bubbles that is amazing value may have to take the other half here for our anniversary!.